Whether you love them or hate them, clowns have appeared in various shapes and sizes throughout history and have ties to ancient Greek burlesque, Roman stage shows, and Chinese Imperial Courts. Ever evolving, the clown during the Middle Ages in Europe took on the form of the court jester or fool, amusing patrons and nobles alike, and getting away with impertinence, so long as the master was amused. Adorned with tassels, bells, pointed hats, colourful wardrobe, and wielding a mock sceptre, jesters or fools provided social commentary and comic relief in a court. The clown eventually returned to the Western stage. In England, France, Italy and Germany clowns provided additional commentary to a performance—standing outside of the main drama, but commenting and provoking the audience. Minor differences in culture were apparent—in England clowns were used as comic foils and relief; in France they were romantic but sad individuals; while in Italy, a clown was a tragic figure with a breaking heart but providing mirth; and finally, in Germany clowns were dressed in bright colours with large footwear and white expressionless faces. Sound familiar? 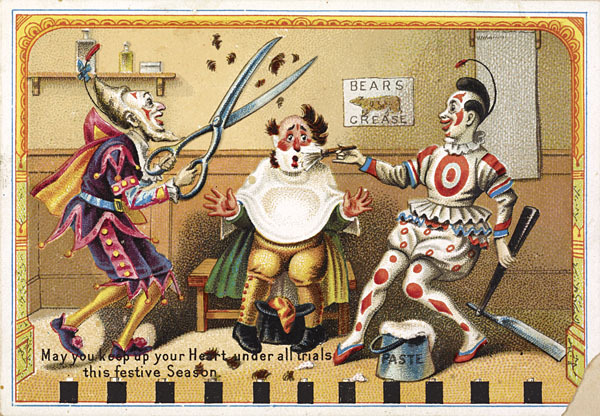 The resurgence of travelling entertainment shows or circuses during the 18th and 19th centuries saw the venerable clown follow suit providing laughter and diversion between events. As circuses arrived in North America from Europe, the clown was present and quickly took a firm foothold on Canadian society and entertainment. During the early 20th century, many traveling circuses crossed Canada entertaining audiences from small to large cities featuring many performers, acrobats, and animal acts with clowns firmly sandwiched between events delighting crowds with their antics and eliciting laughter.